I’ve been flying solo for a while now and unfortunately I’ve become comfortable in my sloth. 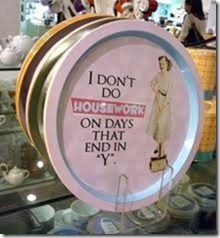 Housework and I have never been good friends. Besides I subscribe to the theory that a house truly becomes a home when you can write “I Love You” on the furniture. So I typically ignore all the mess, dust, and dirt for a long period, only to realize one day that I just can’t stand it anymore. 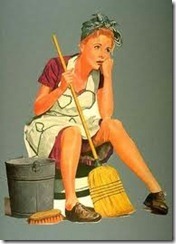 I go on a maniacal cleaning spree and end up exhausted – only to let it all slide downhill again for another month or two. There was a time you could eat off my gleaming floors. I fancied myself a Southern version of Martha Stewart and made centerpieces from holly dipped in 18 carat gold and set the table with the good china and linens. Today I’m doing well if the paper plates match up. I made my bed each morning, carefully mitering the corners and ran the vacuum every day. Now that I’ve retired, there doesn’t seem to be any urgency about keeping up appearances. The little voice in my head assures me I’ll get to it eventually. My ambivalence ground to an abrupt halt this week. My high school friends are all coming home for a school-wide reunion at my alma mater. Since I live a mere 20 miles away, I invited several of my friends to stay with me – never considering the possibility that they might actually take me up on it. Well, they did, and now I’m running circles around the house trying to figure out how to hide all my dirty little secrets in only three days. First order of business was to sit down and make a list of all the chores that needed doing since last spring, but put off for lack of motivation. Motivation will be pulling in my driveway three days from now! Overwhelmed and under pressure, my first thought was to run away from home. But instead, I loaded up a basket with my cleaning supplies and began moving through the house cleaning one room at a time. I reassigned many of my towels and washcloths to “do rags” and went out and bought some fluffy new ones. I also bought a new toilet seat for the guest bath. The old one was one of those little cushioned numbers which apparently had gotten punctured and looked like a flat tire. I called the plumber to come fix the leaky kitchen faucet which dripped whenever I used the hot water. I’d been ignoring it since Easter, and simply boiled water on the stove to get my hot water for rinsing dishes. Everything was removed from the guest room medicine cabinet – including 14 years’ worth of prescriptions which I can’t pronounce along with Lucky Dawg’s worm medicine. I replaced them with a new tube of toothpaste, lotions and shampoo. The green garden mold growing on my porch rails was bleached and sprayed away. Wow. It looked like I had painted the house! I sanded and freshened the paint on my baseboards and began to regain my self-esteem. The best part of it all was the great conversation I had with Elvis after inhaling oven cleaner for two hours. House cleaning can be very intoxicating. You could have called Eva!!! 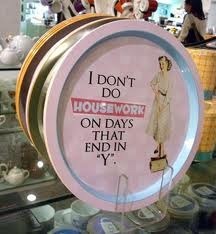 I absolutely suffer from the same affliction and I’m not retired!! !